Certain kinds of maps seem to have a perennial interest with the educated American reader. Maps pertaining to regional dialectal divisions, such as Rick Aschmann’s map of North American English dialects, are a prime example. 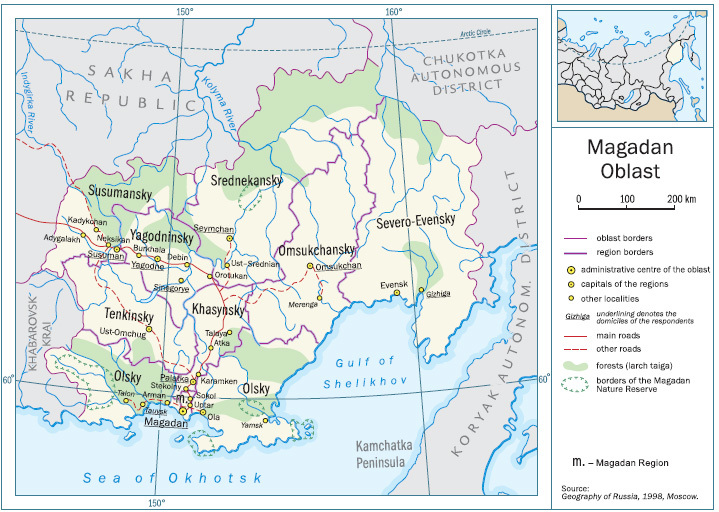 Typically, such maps depict local peculiarities of pronunciation or lexical choices. 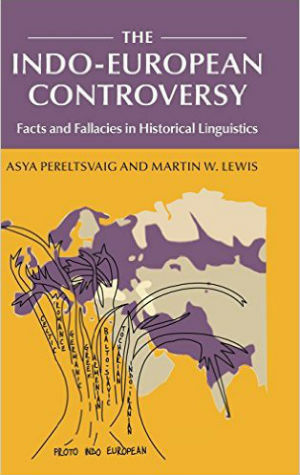 Grammatical structures—which also differ greatly from one region of the English-speaking world to another—are typically left out, feeding into the laymen’s equation of “language” with “lexicon”. For example, in a recent New York Times article, David Brooks equated the changing frequencies of certain words, as seen in Google Ngram Viewer, as “gradual shifts in language” mirroring a changing culture. 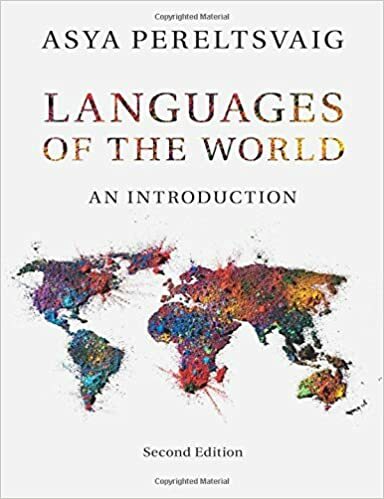 In another New York Times piece earlier this year, Margot Page reflected on her feelings about the traditional “language”, as she called it (not “lexicon” or “vocabulary”! ), associated with the institution of marriage. Even scholarly journals, such as Science and PNAS, publish ostensibly professional articles that are based merely on studies of words yet make much broader conclusions about “language”. In these cases, more modest inferences about “lexicon” or “vocabulary” would be more appropriate. 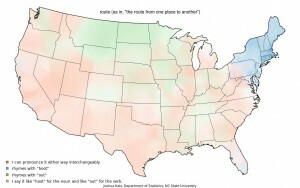 A new set of maps of American English dialects produced by Joshua Katz, a Ph.D. student in statistics at North Carolina State University, have recently received widespread media attention. Originally published in Abstract, a North Carolina State research blog, these maps serve to visualize the data collected by Bert Vaux and Scott Golder in the early 2000s. As explained in the LanguageLog post, the 120-question online survey was based entirely on the self-reporting of students and online participants, with questions given in multiple-choice format. This type of online elicitation is not perfect for a dialectological study, particularly when it comes to the phonological variants, but it allowed the researchers to amass a large amount of data from around the country in a relatively short amount of time, without requiring an army of researchers making field recordings. The survey focused on the pronunciation of certain words, such as crayon, mayonnaise, caramel, and creek in addition to such “staples” as Mary/merry/marry, as well certain lexical choices (e.g. “What is the thing that women use to tie their hair?” and “What do you call the activity of driving around in circles in your car?”). Only a few questions touched on anything that can be termed “grammar”, however loosely construed; respondents were asked, however, about the use of anymore, about whether they would say ‘vinegar and oil’ or ‘oil and vinegar’ for a type of salad dressing, and about their use of consecutive modals, as in I might could do that. 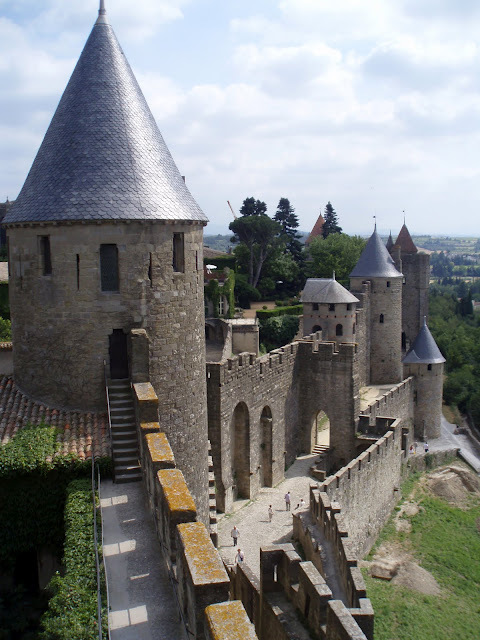 Katz’ contribution is the creation of a statistical algorithm that weighted the responses around particular locations. This approach let Katz generate colorful maps that show how regional dialects are spread across the country. He also created an interactive map that lets you explore the responses to each of Vaux’s 120 questions, as well as a map with a pull-down menu that allows you to see the “aggregate dialect difference” in selected cities. 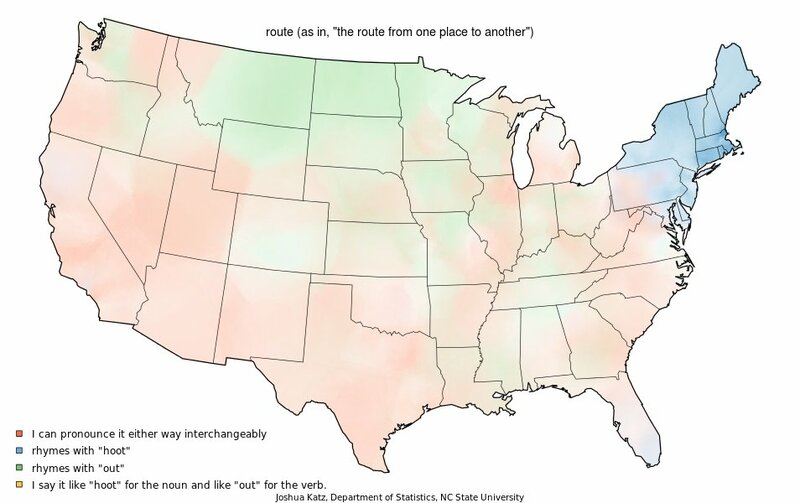 Basically, “aggregate dialect difference” means, “Who else in the U.S. talks like me?” Some of non-interactive maps have been reproduced by Business Insider and Huffington Post. One of the remarkable features of these maps is how clearly they highlight the linguistic distinctiveness of the U.S. South: Southerners call coleslaw slaw, pronounce mayonnaise with two rather than three syllables (“man-aze”), refer to a sweetened carbonated beverage as coke, and use y’all when addressing a group of people. Another typically Southern feature is pronouncing many words, such as insurance and umbrella, with the stress on the first syllable rather than on the second. Other traditionally identified dialectal regions such as Northeastern U.S. or the Midwest are much less striking from these maps. For example, Northeasterners pronounce route as rhyming with hoot. 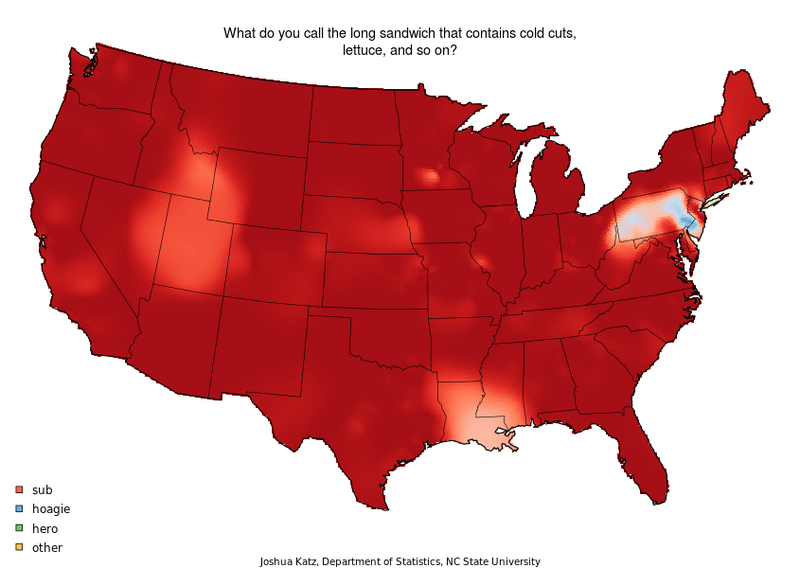 Also, Northeasterners pronounce caramel in three syllables (“carra-mel”), but so do the Southerners and the Floridians. Another feature that appears to be shared by speakers from a large swath of the country extending from Texas through the South (including Florida) and along the East Coast all the way to Maine is the pronunciation of pajamas with the low back vowel in the second syllable, as in father (“pa-jah-mas”) rather than a low front vowel as in jam. Another feature peculiar to the Northeast is the use of sneakers (instead of tennis shoes) for ‘the rubber-soled shoes worn in gym class, for athletic activities, etc.’—but inhabitants of southern Florida use sneakers as well. Additional regional features include the pronunciation of been with the vowel as in set (which is how most Americans pronounce the name Ben), which is found in the so-called Northern Cities (i.e. large cities of the Midwest) but extends farther west than most documented cases of the Northern Cities Vowel Shift; the pronunciation of pecan with the stress on the first syllable in the Northeast and in the Mid-Atlantic coastal area, as well as in northern Wisconsin; the use of rotary rather than roundabout or traffic circle in New England; and the referent of the expression the City (New York City, Boston, Chicago, are the only choices mapped by Katz, but San Francisco, Los Angeles, DC, and Seattle seem to emerge as other local possibilities in the original survey). 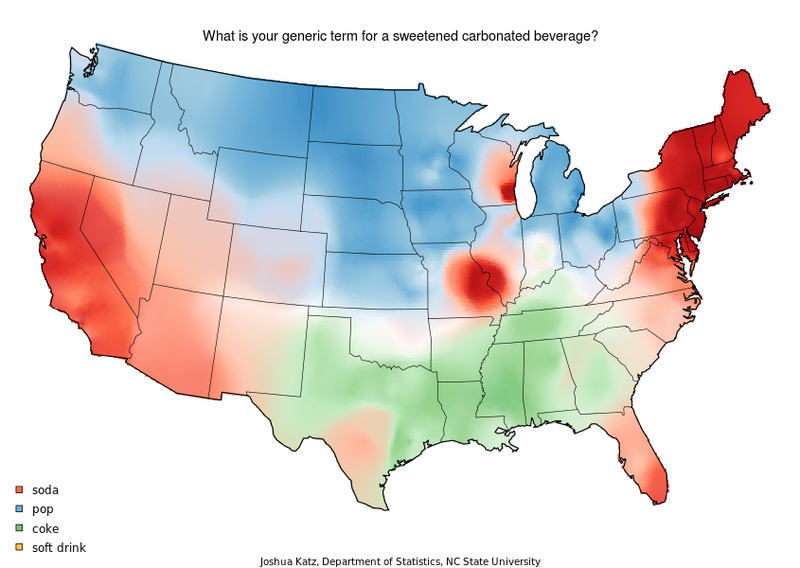 Even more localized are the pronunciation of syrup with a long [i:] vowel in the first syllable (“sear-up”), found in eastern Pennsylvania, and the word bubbler for ‘the thing from which you might drink water in a school’, found in eastern Wisconsin and Rhode Island. 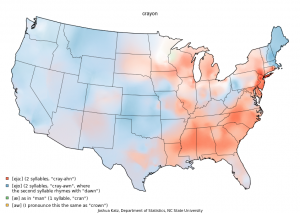 While some of these maps are a great way to visualize novel data on American English dialects, others fall short of earlier maps that depict the same linguistic features. 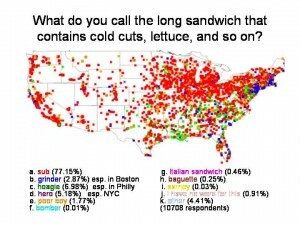 For example, Katz’ map of the words for ‘the long sandwich that contains cold cuts, lettuce and so on’ has only three words: sub, hoagie, and hero. However, many other regional variants exist, including grinder (used especially in Boston), poor boy or po’boy (in the South), and sarney. 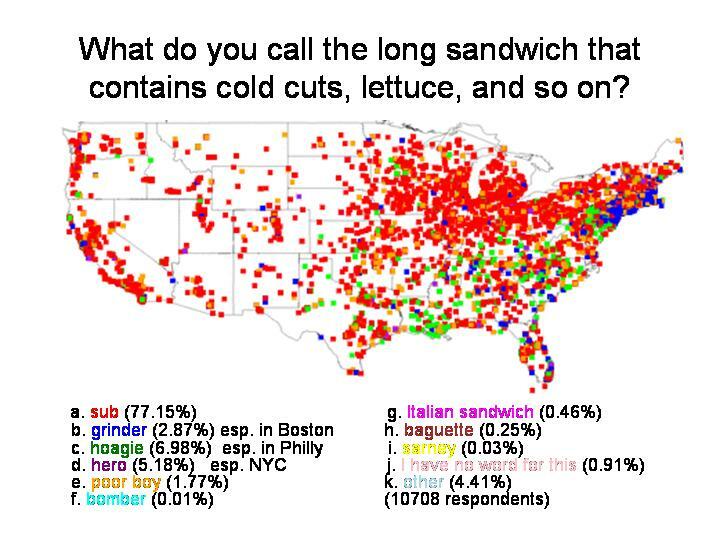 The map reproduced on the left, though difficult to read as responses depicted by squares overlap, shows more options than does the map created by Katz, which only highlights the use of hoagie in Philadelphia area. Even the use of hero in the NYC area is inconspicuous on his map. 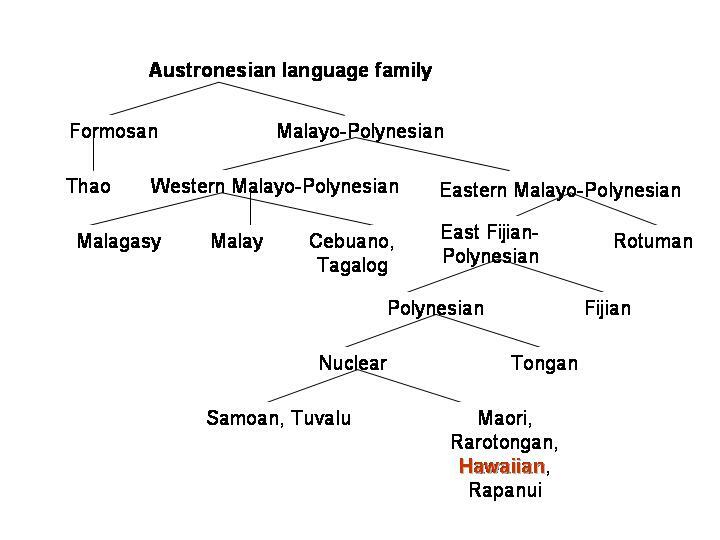 Similarly, the map pertaining to the form of address for a group of individuals (i.e. 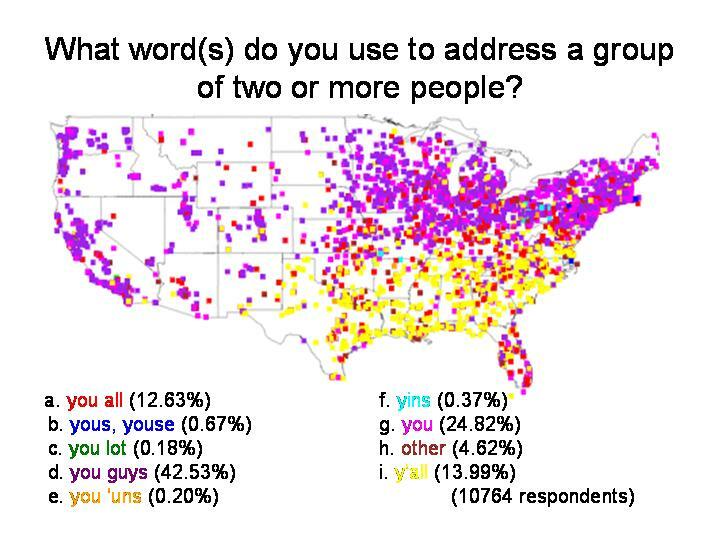 a specialized plural form of you)—which Business Insider calls “the deepest and most obvious linguistic divide in America”—does not reflect all the local options. Most of the country is shown as using you guys, while the U.S. South (exclusive of southern Florida) uses y’all. The only other form reflected on this map is you all, used in Appalachia. Yet as can be seen from a more detailed map reproduced on the left, other forms such as yous, you lot, you’uns, and yins have regional correlates as well. Another issue pertains more to the original survey than to Katz’s new visualizations of the original data: since Vaux and Golder’s survey was based on an online questionnaire, the respondents were not necessarily representative of the overall population, with younger generations being overrepresented. As a result, some of the regional features captured on earlier dialectal maps are much less conspicuous in this survey. 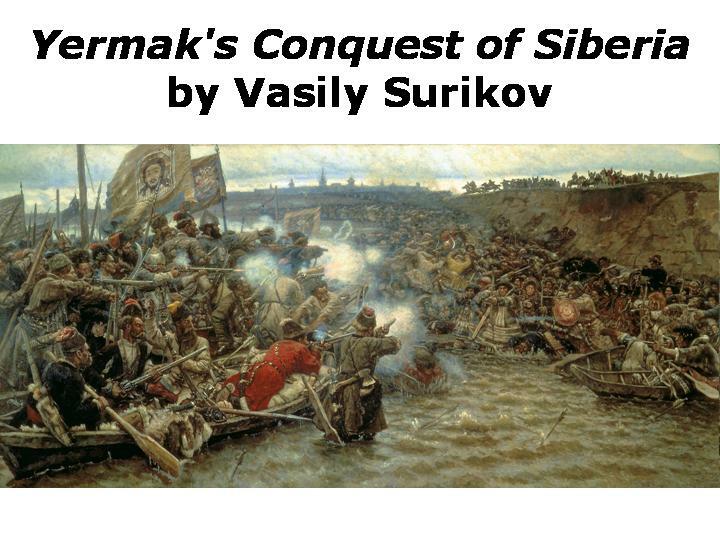 For instance, it appears that the pronunciation of creek with a short vowel (as in crick) was far more widespread just a couple of generations ago than it is now. My personal favorite is the map pertaining to “What do you call it when rainfalls while the sun is shining? 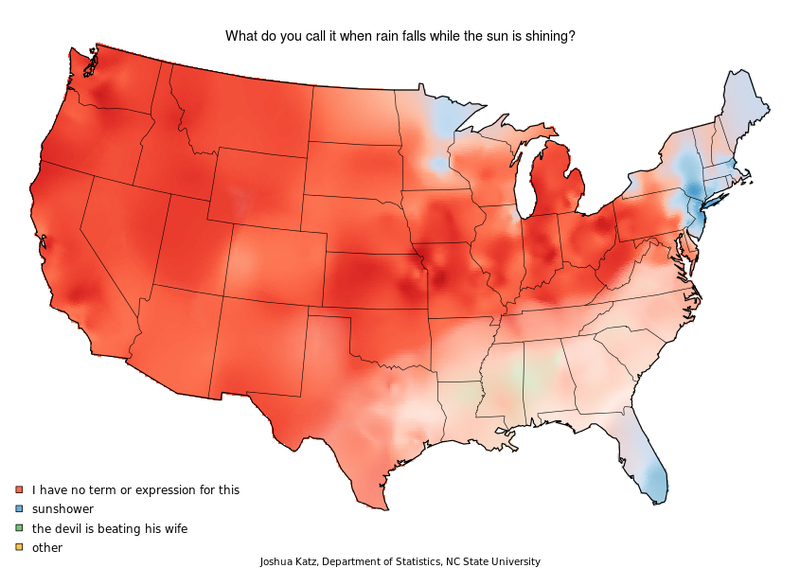 Most Americans do not have a special word or expression for this phenomenon, but some Northeasterners and South Floridians call it sunshower, whereas residents of Alabama and Mississippi evidently refer to this condition as the devil is beating his wife. Really?! Other colorful responses mentioned in the original survey include (in the order of decreasing “coolness”, in my opinion): the wolf is giving birth, monkey’s wedding, fox’s wedding, pineapple rain, and liquid sun. In Russian, we call it “mushroom rain”, as fungi are supposed to grow best in this combination of rain and sun.